One work of mine in this exhibition. This exhibition features work by artists made over the last 20 years who have all been influenced by the rapid development of technology. The approach of each of the 26 artists and collectives to their practice is different, resulting in a rich and contrasting view of the world and the culture that surrounds us. 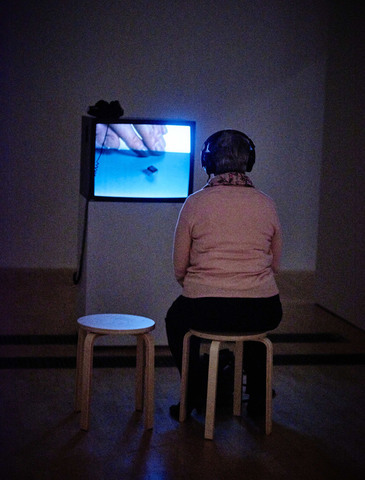 The artists have used computer animation, video, computer graphics, audio, photography, drawing and gaming technology to create films, moving image, sculptures, paintings, interactive games and small and large scale drawings. The artworks themselves tackle a range of themes such as human relationships and behaviour, surveillance and the habits of modern society. The title is inspired by ‘I Want! I Want!’, an etching created by the artist William Blake over two hundred years ago. It depicts a tiny figure standing before a celestial ladder that leads up to the crescent moon. The image acts as a metaphor for humankind’s ability to dream and turn ideas into reality. Works selected date from the mid-1990s to the present day and are drawn from the Arts Council Collection, Birmingham’s museum collection and other public and private collections. Artists and collectives include: Daria Martin; Dryden Goodwin; Rachel Maclean; Julian Opie; Brian Griffiths; Stefan Gec; Michael Fullerton; Thomson and Craighead; Cao Fei; John Gerrard; Paul Pfeiffer; Aleksandra Mir; Iain Forsyth and Jane Pollard; Edwin Li; Ryan Gander; William Blake; Ed Atkins; Shezad Dawood; Toby Ziegler; Fiona Rae; Eddy Kamauango Ilunga; Rose Finn-Kelcey; Gary Perkins; Massinissa Selmani; Alan Currall; Marcus Coates; and Clare Strand.